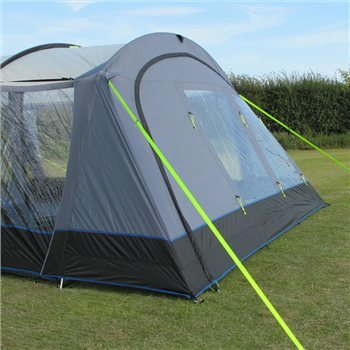 The Kampa Croyde 6 & 8 vestibule will make an excellent addition to your Kampa Croyde 6 or 8 Tent as it will make the large porch area even more usable. Attaching to the front of the tent and completely enclosing the end, it will provide you with another area protected from the wind and rain. Perfect for storing your camping gear or bicycles etc. Made with a large zipped doorway in the same mocca colour to match your Kampa croyde 6 & 8 Tent. Will fit the 2017, 2018 and 2019 poled Croyde Tents. We bought this to attach to our Hi Gear Premium Oasis 6 and it fits like a glove! Very happy with product, in every way. It gave us extra warmth and kept the rain out, whilst also allowing us to have a perfect view on the sunnier days. Plenty of pegs, a carry case and the eyelet holes in the corners ensured extra security for windy days. There were no instructions included, but an email to Kampa fixed that. We love the added space and protection that the vestibule adds to our tent. The 4 starts was the lack of instructions in the bag and the difficulty in setting it up. If you are short you may have trouble attaching the vestibule to the top of the canopy.